Vice Admiral Sir Guy Wyatt had no sooner taken office as Hydrographer than he was agitating to bring the surveying fleet up to strength. As after the previous war, early replacements could not be new vessels when there was a vast surplus of shipping, including many nearly completed hulls, available. 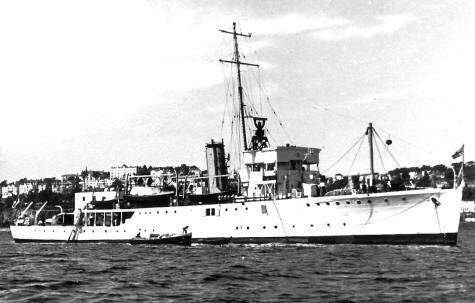 As an immediate measure two Halcyon class minesweepers, Sharpshooter and SEAGULL, were given similar conversions to those built into Jason and Gleaner pre‑war, and replaced these latter in the post‑war surveying fleet. With luffing davits and radar fitted, the mainmast which the other two had carried and which had in any case been removed to avoid fouling the AA arcs during the war was not replaced. Both were ready for service in the new role by early 1946. SEAGULL and Sharpshooter thus introduced the third variant in surveying Halcyon masting, since though they, like their predecessors, were fitted with a beaconing derrick and stump on the forecastle and maintained their foremast aft of the bridge, they did not have their mainmasts restored, so a Halcyon in surveying white and buff without a mainmast must be one of these later two. N.W. Approaches to St George’s Channel; Lough Foyle. Weston Super Mare to Portishead. Worms Head to Watchet; Swansea Bay; Sker Point to Nash Point. ; Barnstaple and Bideford. Bolt Tail to Teignmouth; Tor Bay. In an early use of electronic aids for surveying Collins in SEAGULL in 1947 used constant radar ranges of a prominent object to control his lines of soundings, meanwhile fixing his position along them by sextant angles in the traditional way. In the strong tidal streams and difficult waters off Northern Ireland this expedited sounding quite considerably, and the method was promulgated in a Professional Paper to the fleet. 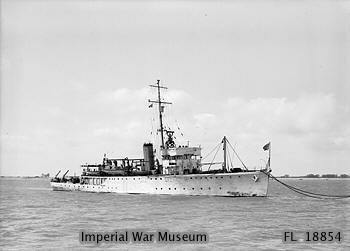 (In 1949) Seagull was employed in the Bristol Channel, mainly sweeping for wrecks, of which there were plenty. Recreation and replenishing was at Swansea, Cardiff and on one occasion, Avonmouth. In mid-December, the end of the surveying season, we returned to Devonport for refit and chart draughting until March 1950. The 1950 surveying season ( Seagull's last ) was spent surveying in and around Torbay (Bolt Tail to Paignton). What a glorious finale! Became the naval drill ship at Leith in 1955 ?